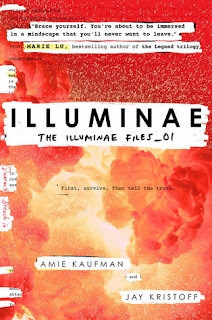 Illuminae excels in all areas required to make a great book. I fell in love with it and flew through all 600 pages in a day. That's how good it is. What was amazing about this book is the storytelling behind it. The set up of the narrative is unique and incredibly creative, which creates an interest around the plot. The story is told through IM chats, interview transcripts and surveillance reports just to name a few. I found it so engaging, making it feel like the files was suppose to be for me and I was present whilst the events were happening. The presentation of the book and the flow of the storyline would not have been successful without the incredible writing by Kaufman and Kristoff's. They created a fast paced and intense plot and I was hooked right until the very end. That says a lot considering I don't read a lot of sci-fi because it's not something I find interesting. But Kaufman and Kristoff's method of relaying information about the world, the technology and everything else that any sci-fi novel needs is very smart and doesn't feel like I'm being bombarded by stacks of information in order to understand it all. Amongst the intensity, Kaufman and Kristoff also included very humorous moments that made me laugh out loud. Some of it was definitely a lot more inappropriate than what I expected so I do think this is suited for a more older age group within Young Adult readers. I loved that there two very distinct voices despite the unconventional means to introduce and develop the characters. Both Kady and Ezra had great character progression and I was invested in their lives from the moment the book started. Kady is brave, intelligent, snarky and the attitude that she had won me over. Ezra is hilarious and the friendships he built felt genuine, which made me feel like I wanted to be friends with him as well. Illuminae is truly a fantastic experience, combining great writing, strong plot and even explores issues of the greater good, humanity and loyalty as things to mull over whilst reading. I did find there were some moments I glossed over because I was a little lost with some of the layout of the story. Still, as a novel I would say it hit the mark and I was left with a massive book hangover. I implore you to definitely give this a try! Yes, yes, yes!! I feel like my review didn't do the book justice but it was absolutely amazing and I can already see myself diving right back into it just before the second book comes out. Thanks for reading my review! !